Ever wondered about the story behind the buildings that tower over Uptown Charlotte? Here's a look at the 10 tallest buildings in Uptown, and a little history about each. As is standard when measuring buildings, the height measurements do include any architectural features but do not include antennas. Housing the world headquarters for Bank of America, this is the most prominent building in Charlotte's skyline. From 1992 to today, this has been Charlotte's tallest building. It's the tallest building in North Carolina and the tallest from Philadelphia to Atlanta. In the film Shallow Hal, the main character (played by Jack Black) works in this building. The building sits on top of the Rudisill Gold Mine, a mine from the nation's first gold rush in Charlotte. Construction workers actually found gold while working on this project. By square footage, this is the largest building in Charlotte. This building was intended to be the headquarters of Wachovia Bank, You may recognize this building if you watch Carolina Panthers football games or other events at Bank of America Stadium. It towers prominently over the stadium's east side, and the tower's light show is often used when teams score. The light show is also a prominent feature of Charlotte's skyline, with a different color combination almost every night representing a local team, a convention or prominent event in town, or a local community group. The Vue is one of the tallest residential buildings in the state and the Southeast. Presently, the Hearst Corporation has offices in this complex. A Bank of America trading floor in the Hearst Tower was one of the largest in North America at three stories tall. Unique about this building is the "reverse floorplate" design. The upper floors are actually slightly larger than those on the bottom. When it was opened, this building was called One First Union Center - a named that changed with First Union's purchase of Wachovia. The building was known as One Wachovia Center until the Wachovia headquarters would move to a new building. The current name was adopted when it became the headquarters for Wells Fargo East Coast Division. From 1988 to 1992, this was the tallest building in Charlotte. From 1974 to 1988, this was the tallest building not just in Charlotte, but in North Carolina. You'll find the well-known "Il Grande Disco" sculpture (the large gold disc) adjacent to this building. 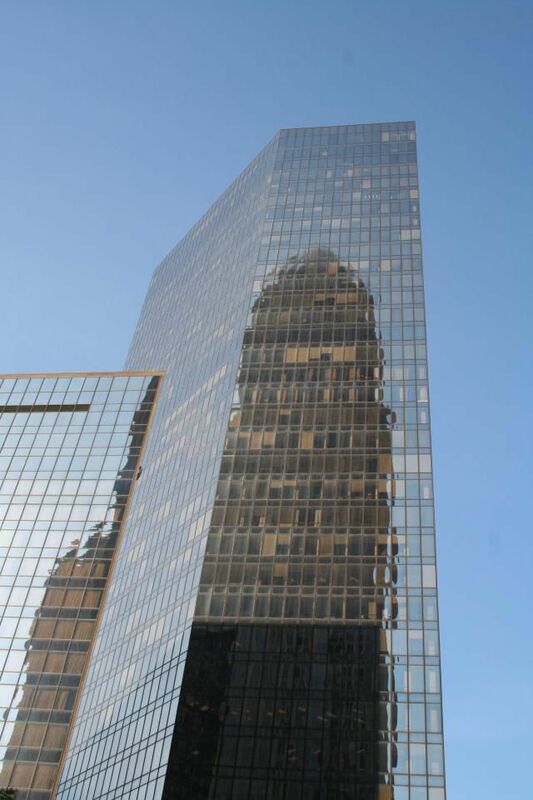 With its limestone, granite, and marble exterior, this building (formerly known as "The Interstate Tower) stands out from all the glass and steel surrounding it. The Charlotte City Club occupies the top floor. The largest tenant is the Chicago Bridge & Iron Company. This building now houses the regional headquarters for Fifth Third bank.